The Ottawa Redblacks re-signed wide receiver Brad Sinopoli to a two-year contract on Thursday. 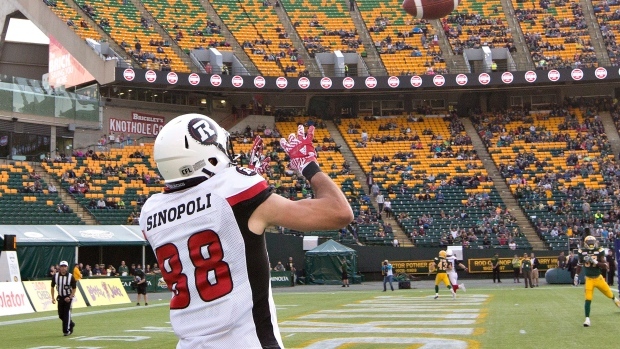 Sinopoli posted 1,009 yards and three touchdowns on 91 catches this season. His season came to an early end in late October due to a shoulder injury. “Brad has been a big part of this team both on and off the field since he came here and we’re looking forward to having him back,” said general manager Marcel Desjardins said in a release. “We could not envision heading into the 2018 season without Brad Sinopoli." Sinopoli has topped the 1,000-yard mark in three straight seasons with the Redblacks since coming over from the Calgary Stampeders. He will turn 30 in April.